The Bicycle Stick Man Sword Play is said to be the first in a series of 3. 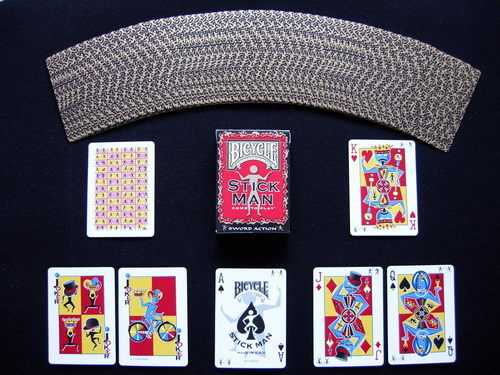 It features an all-over gold and black back design with all different stick man animations, and the faces have stick men in the top right/bottom left corners which are brought to life by riffling through the cards regardless of their order. The court cards are fully customized with stick men and women. Comes with 2 custom Jokers, a custom Ace of Spades, and a card showing all 52 fencing positions of the stick men on the faces.